I love the shedworking site as much for the photographs as the written content. At some point in the future we may move to a house with a different yard and when that happens I’m definitely going shed. 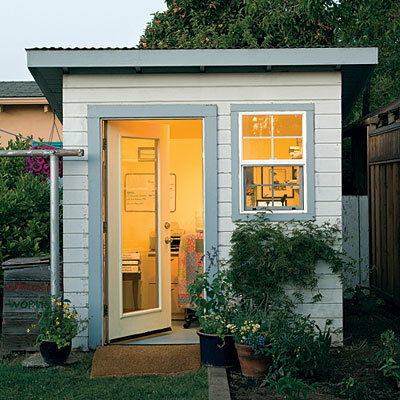 Shedworkers can surround themselves in a wonderful, peaceful, custom enclosure; a tightly focused working environment. The book is in my Amazon wishlist; I’ll be getting it soon. I’m at geekend2010 this week, in Savannah, GA. One of the sessions this morning was a talk about remote working, given by Jayna Wallace. Gone are the days when physically being in the office is required to get your work done. As companies look towards workshifting (or telecommuting, for you old-skoolers) to reduce costs and recruit top talent, opportunities for “digital nomads” are more widely available than ever. And while it’s not all fun and games, once you leave the office, you’ll never want to go back. Ever. Learn the tips and tricks from someone who’s spent the last five years working for geographically diverse companies, spanning time zones and continents. “Telecommuting” is so 2002. “Remote Employees” are the new black. It was a great overview of the remote employment, filled with examples from Jayna’s own work history. One nice touch is she added in a good bit about *how* to become a remote employee – approaching management with a proposal and backing it up with great reasons to put you back at home. The Charleston area’s co-working situation now has a dedicated space in North Charleston, CHSCoWork is starting small and open on Thursdays. I wish them luck! Another site aggregating workplaces! Awesome. I love this – such a great way to share this information. What a great idea. Aggregating all kinds of spaces, you can find one or list one. I love the interface! Continuing the theme while I conjure up a full post on the subject. The gain in speed, productivity and happiness is massive. I haven’t been to my company’s office in a long time – 2 years now? While that hasn’t been fully the best thing personally (I miss some of the direct interaction that exists with people I normally don’t work with), there has been almost NO negative affect on my productivity, ability to execute and overall job satisfaction. The office really is dead, at least in software development circles. There are so many places for a group of coworkers, especially if they’re geographically centralized, to meet. Coffee shops, coworking locations, hotel conference rooms, college campuses, etc. all satisfy the need for a face to face meeting without the overhead of a permanent physical space. All satisfy what might be single benefit of an office (the quick “everybody into the meeting room” need) while obviating the archaic traditions of office working. Even if not geographically centralized, options abound. And more are possible every day. More to come about my own use of space in doing my daily work. This summer has been interesting around here, and working from home has made some great things possible. Oh my. The Oatmeal is awesome.